Look amazing coming and going to all your events this season. The Beauty No. 2 Open Back Long Sleeve Dress is all about color, fabric and flow.When you walk into the room this dress moves beautifully with you. This fashion dress pops with color; the draping open back and curved hemline make it a classic with an edge. 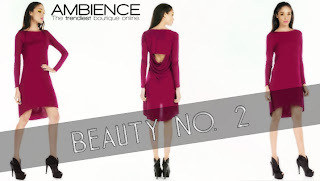 Let the invites come, we have the perfect dress for you at Ambience.